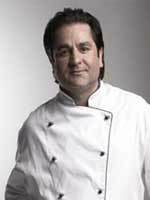 Guy Grossi is an affable, passionate and playful master chef who specialises in pure Italian cuisine. He commands three kitchens with discipline, song, music, creativity and devotion. Guy is the driving force behind one of Melbourne's oldest restaurants, Grossi Florentino in Bourke Street Melbourne, and Mirka in Fitzroy Street St Kilda and has opened his first international venture Grossi Trattoria & Wine Bar at the Intercontinental in Bangkok. A popular media personality, Guy is currently in production co-hosting of a special Food Safari series for SBS, he makes regular appearances on David and Kim, MasterChef, A Current Affair and across all networks as the fun, flamboyant, skilled and entertaining Chef. Guy enthusiastically shares his love and excitement for tradition and in creating the exceptional dish. He has plenty of stories to tell relating to his family heritage, the history of recipes, and his own personal journey as one of Australia's most successful Chefs. He started cooking with his father Pietro, who was originally brought out from Italy by his grandparents to work as a chef in their restaurant Mario's. Guy then worked at a seafood restaurant with a "mad chef, a Czech who was very hard. He used to make me cry a lot when I was 15". He says this gave him strength for the next jobs before he joined Tolarno's where his father was working. He was then at Two Faces with Hermann Schnieder, and after that went into his own place, Quadri. He and his Australian wife Melissa were there for 3 years and then opened Caffe Grossi, before taking over Grossi Florentino and in 2007 opening up at the site of Tolarno's, Mirka. Guy's concern is getting, and keeping, the balance right in the kitchen. "It is very difficult to maintain consistency with our style of cooking, it is classic Italian, but we do come up with certain things that may not be in an Italian cook book." But Guy believes that whilst the food may not be strictly traditional, "when you taste and touch, it's an Italian dish...it must have that identity whether created two minutes ago, or thought of two hundred years ago." Guy is natural performer and with a huge personality, wit and charm, he's a colourful and entertaining master chef.